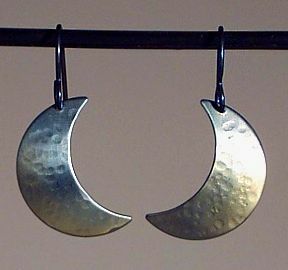 Moon2: Medium Titanium Crescent Moon Earrings domed and cratered by multiple random impacts by multiple sized projectiles. No two quite alike. The color fades from a gently sky blue to a buttery moonlight hue. Also available in a smaller size.